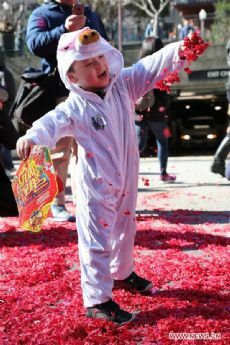 SAN FRANCISCO, Feb. 5 (Xinhua) -- San Francisco Mayor London Breed, dressed in red that represents happiness and good luck in Chinese culture, on Tuesday launched official celebrations of Chinese Lunar New Year in the city's Chinatown. Speaking in Cantonese and English, Breed extended her warm greetings to a large cheering crowd of overseas Chinese and their American friends for the Year of the Pig, which starts on Feb. 5 this year. "Happy New Year and wish you all a good health and wealth," Breed said in Cantonese. "I'm being upstaged by a pig," she joked, referring to cute piglets held in arms of Miss Chinatown pageant queens to highlight the Chinese elements of the Year of the Pig. Breed commended the diversified Chinese heritage and culture that enriched communities in San Francisco, and the important contributions of the Chinese community to the United States. "I am so excited to be the mayor of such an incredible city where we celebrate our diversity, where we celebrate our culture, where we focus on really important opportunities to really engage with our families in our communities," said the mayor. 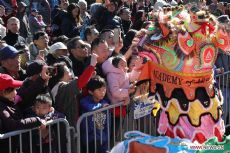 "Lunar new year is that celebration which really highlights the importance of family, of coming together, (and) of community, and I'm celebrating each and every person that is important to our communities and our neighborhood," she added. Breed outlined to the audience a series of festive events to be staged in San Francisco Chinatown during the New Year period. "Here in our city, we will break bread together, we will watch and celebrate the festivities together," Breed said. She promised that there will be a market fair this week in Chinatown, where one can find flowers and goodies, such as red envelops for kids and oranges which in Chinese translates as "good luck." 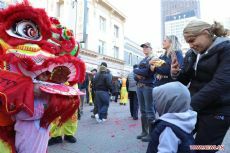 Breed said she will attend San Francisco's grand Chinese New Year Parade scheduled for Feb. 23, a Chinatown tradition that dates back to the 1860s. The parade features beautiful floats, outfits, costumes, firecrackers, newly crowned Miss Chinatown U.S.A, as well as the dance performance of an 88-meter-long golden dragon operated by 180 men and women from a local martial arts group. Breed called the Year of the Pig "one of luck and prosperity and hope for the future." Chinese Consul General to San Francisco Wang Donghua extended his best wishes to local overseas Chinese, adding that China has made great progress in economic development by rolling out a host of measures aimed at improving business environment in the past year. Last year, China's GDP exceeded 90 trillion yuan, an equivalent to 13.6 trillion U.S. dollars, up 6.6 percent year on year, Wang said. These figures showed that China's economy has maintained a stable and a good momentum of development, said the Chinese senior diplomat. Among the crowd, a 15-year-old high school student, who only identified himself as Logan, said he was happy to be a part of the exciting celebrations, and he came for the event every year. "Each new year is different, and I can always feel something new from the thrilling festivities," he said. The lunar new year was celebrated with lion and dragon dances, performances by a group of kindergarten kids who cosplayed piglets in colorful costumes, and boisterous drumming shows. The celebrations climaxed with a 50-meter-long huge, golden-colored dragon dancing in high spirits on the main street in the heart of Chinatown, amid sound of firecrackers blowing up in mid-air to usher in a new year.